“If it’s baroque, fix it.” Or classical / romantic / modern, for that matter. 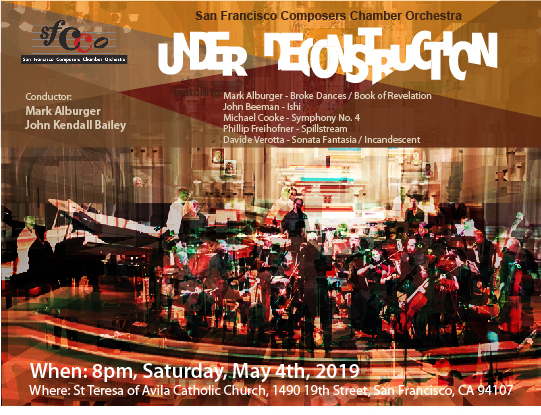 The San Francisco Composers Chamber Orchestra takes everything Under Deconstruction, turning the old new and the new newer. The fun begins with Philip Freihofner updating Terry Riley’s loop technology in computer-activated ostinati against oboe improvisations, resulting in Spillstream to rival a sonic Lake Oroville outlet. Next Davide Verotta verily dazzles with both Sonata Fantasia piano updates and Incandescent music for five percussionists and strings. Not to be outdone, Michael Cooke deconstructs Beethoven dramatically and unexpectedly in Symphony No. 4, with nods to the Fifth and Eighth of the B-Man. And speaking of such, John Beeman presents another in his series of Ishi evocations, where the clash of cultures rises to new levels of passion and poignancy. Also hoping to get a rise will be Music Director Mark Alburger‘s takes on Broke Dances, breaking towards an apocalyptic musical meltdown re the Book of Revelation. Revolutionary, all!